Hat-trick hero James Collins believes the Hatters can really go places this season as long as they keep hold of manager Nathan Jones. 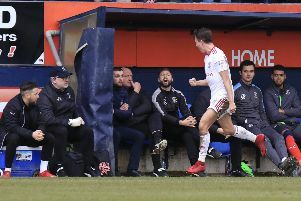 The Town boss revealed that over 30 scouts watched their win over Plymouth on Saturday, as Luton played some seriously eye-catching football throughout the 5-1 hammering. I’m delighted that he wanted me here and delighted to play for him and I think if he stays, then we’re a club going somewhere. With Jones already linked to a number of vacancies in the Championship since taking over back in January 2016, his stock will surely continue to rise as Luton are now firmly in contention for back-to-back promotions. It could lead to some serious interest in his services, but Collins is desperate for Jones to stay should that happen, saying: “I think it’s really important that we keep hold of him because a lot of clubs have been interested in him. “He’s stated that he wants to stay here, he loves it here, his family are down here and he’s building something here. “We all believe in him, we all want to play for him and he gives us confidence. “He’s a young manager doing really well and you don’t see many of them very often. Collins, who bagged his second Luton hat-trick in the Pilgrims annihilation, admitted that the environment created by Jones shines through in their performances on the pitch. After moving to the top of the club’s scoring charts with his treble on Saturday, he added: “I love every minute of it here. “Last year, my first year, couldn’t have gone any better, 20 goals and promotion. “We didn’t win the league, that was probably the only regret, but I’ve come back this year and managed to keep a regular place at the minute. “I’m just enjoying my football, I love coming into training every day, it’s a real good place to be and a credit to play for this club.